Many modelers focus on a specific point in time to guide their layout efforts. There are a number of markers that can be used to pinpoint the time an image was taken. Many railroads introduced emblems or new lettering at different points in time on their rolling stock. Steve Hedlund sent along details about Missouri-Kansas-Texas box car lettering practices that I found interesting so this blog post is mainly Steve’s. I added a couple points at the end and I’m certain this type of info will be revisited. For now, enjoy Steve’s work. With Accurail’s upcoming release of a Missouri-Kansas-Texas (MKT) decorated 36-foot box car, there is something to understand before buying the Katy car, relating to paint and lettering schemes. 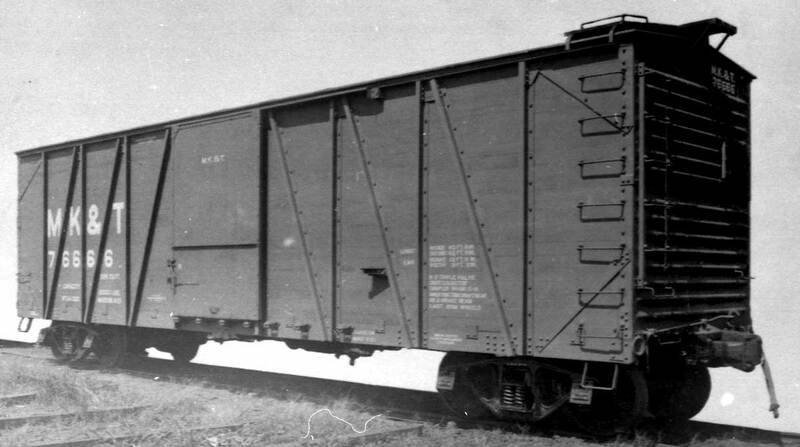 Until 1915, all of their box car lettering was spelled out as “Missouri Kansas and Texas” or “Missouri Kansas and Texas of Texas.” Box cars in the lead image and above illustrate the early lettering. In 1915, the railroad went into bankruptcy and adopted a new lettering standard with the blocked initials replacing the spelled out name. The cars were painted box car red but with white “MK&T” lettering. The railroad came out of receivership in 1923 and the name changed to “Missouri-Kansas-Texas”. 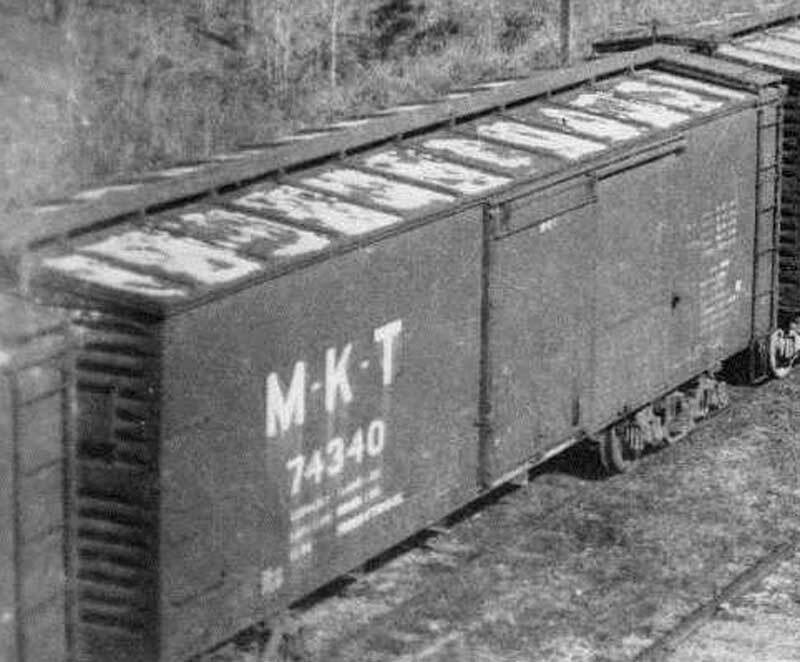 The current standard lettering scheme for freight cars was kept but they altered the blocked initials from “MK&T” to “M-K-T”. Box cars 74340 and 75339 seen here appear in 1936 and are in box car red paint with the blocked “M-K-T” initials. Both cars were built in 1913 by AC&F (74100 to 75679 series). According to details on the upcoming Accurail car, models will be offered are these same series of cars but in yellow paint, so let’s talk about the yellow paint. Katy’s famous yellow paint is called “Sloan Yellow” which is named after Matthew Sloan, President of the Katy from 1934 to 1945. He introduced the yellow color by painting box cars, stock cars, cabooses and even depots in this vibrant shade to have his railroad appear more attractive to the shippers and to the public. The yellow paint then becomes a time marker. A MKT car that is painted yellow is only authentic from 1934 onward. I do hope Accurail produces a version in the red scheme to benefit modelers of the earlier years. Here a thumbnail guide to the MKT box car lettering. Thank you, Steve, for the informative paint and lettering details! I was not aware of most of these MKT details. These details add to the authenticity of our railroad modeling. As I first read Steve’s notes, I was reminded of other time markers that have been discussed in emails but not noted here. Here are a few notes on emblems for a handful of large railroads. The Baltimore & Ohio emblems were not used on freight cars until 1937. The Pennsylvania Railroad Ball Keystone emblem was not applied to freight cars until 1930. The New York Central oval represented New York Central Lines until November 1935 when this was changed to New York Central System. These are just a few easy to spot details that can guide our model efforts and also to understand a prototype photo. I’ll feature more in a future blog post. Another excellent blog article! I had my own run in with time markers on B&O hoppers. As I was beefing up my hopper fleet I added a lot of B&O hoppers due to a mine with a B&O connection on the Adena Branch. My mistake was not knowing between 1940 and 1962 the B&O had eight different hopper lettering styles. I ended up with a few that aren’t appropriate for a layout set in the mid-50’s. I’m sure through this article and future ones, I’ll find other examples of inappropriate paint/lettering in my fleet. Great as far as it goes! When did the ‘Katy’ script logo begin to be applied? I think I’ve seen it on Brown as well as Yellow cars. I believe later cars (50′???) were delivered in Brown. When would yellow have ceased to be applied? THIS is the sort of information we sorely need, hidden away in historical society publications or making an appearance in the rare article in a major model publication. THIS is why I really love the internet, but more than that, why I really appreciate this blog for being a gathering place of these arcane details. A very sincere and heart-felt THANK YOU again, Eric (and Steve) for collaborating and cooperating with the wider 1920’s modeling community. 1990s. There was a layer of tar paper put up throughout the boxcar for insulation resulting in the preservation of most of the original lumber used in the construction of the boxcar. 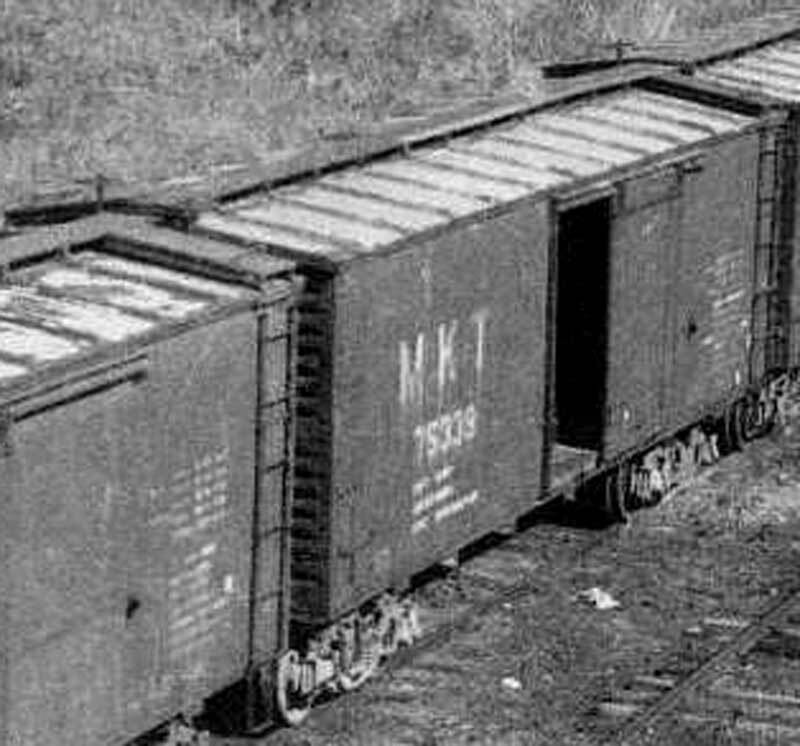 Does anyone know what species of pine lumber was used in making the boxcars?